I am a member of the Collective Bias® Social Fabric® Community. 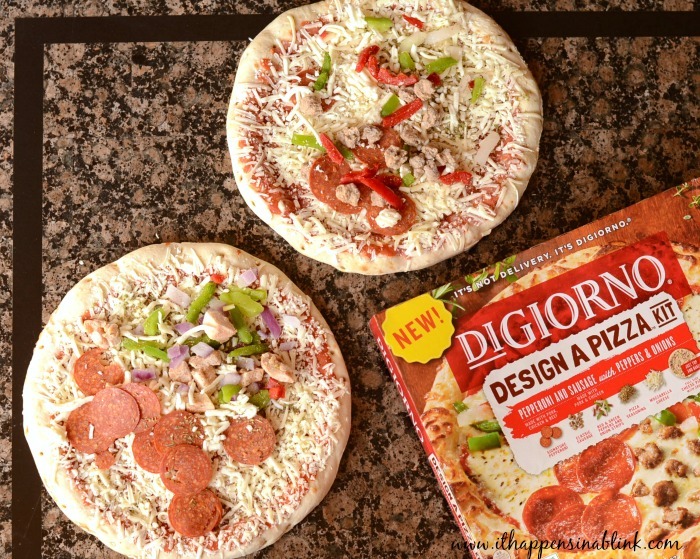 This DIY Pizza Apron and #Digiorno #DesignAPizza shop has been compensated as part of a social shopper amplification for #CollectiveBias and its advertiser. My husband rarely has to go out of town for extended periods (thankfully!). Every time he does, my daughter acts like it’s the worst day or week of her life. She moans and groans until he returns. I’ve discovered that planning special events gives her something to keep her mind off of his absence. Of course, I have three other kids in the house so I can’t really pack up and take the kids many places. I’ve found that simple projects tend to be the best. Recently he took our youth group students to camp for a week. I planned a library run, a water play day, and a Pizza Night. I made the Pizza Night easy on myself and used DIGIORNO® Design-A-Pizza kits. These, paired with my DIY Pizza Apron, made for a fun Pizza Night! 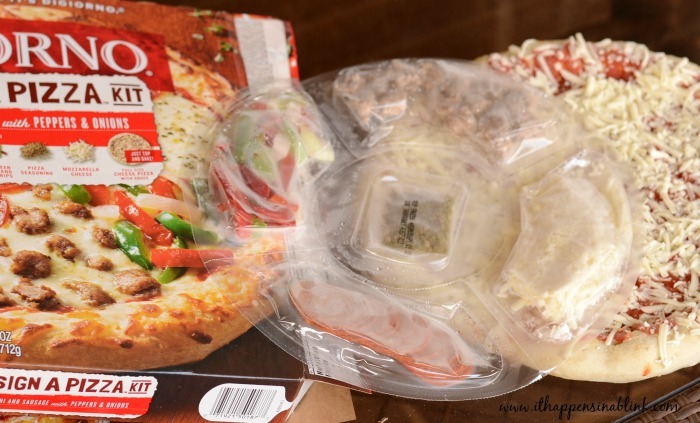 The DIGIORNO Design-A-Pizza kits are easy for moms and kids. We made two of them for our Pizza Night: Pepperoni & Sausage with Peppers and Chicken, Green Peppers and Red Onion. 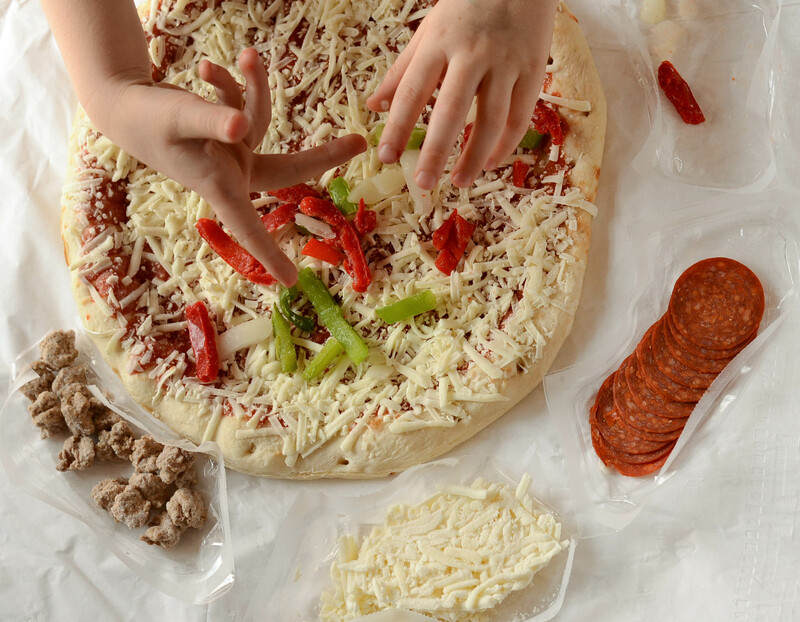 The meat, seasoning, cheese, and veggies are pre-chopped and pre-packaged in the Design-A-Pizza kits.They are very convenient! And, apparently, frozen pepperoni is still edible. Here’s her finished creations. Can you see the dividing line between “our sides?” I guess there are no pepperonis for me! After designing, bake the pizzas in the oven according the the package directions. 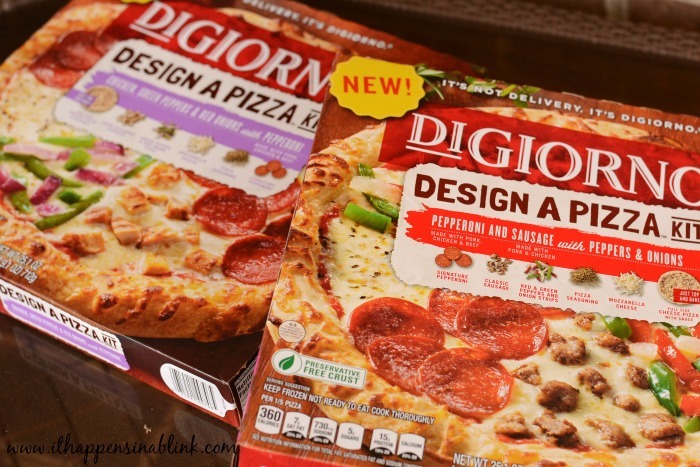 Want to have your own Pizza Night with DIGIORNO® Design-A-Pizza kits? I purchased mine at Walmart in the Pizza section. Now, are you feeling crafty? Let’s make a DIY Pizza Apron for the kids! 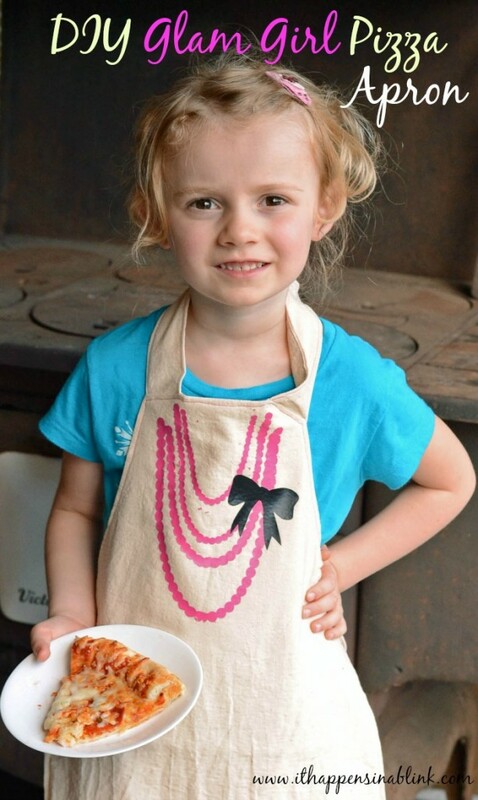 This apron pattern is designed for children who are in a size 5-6. 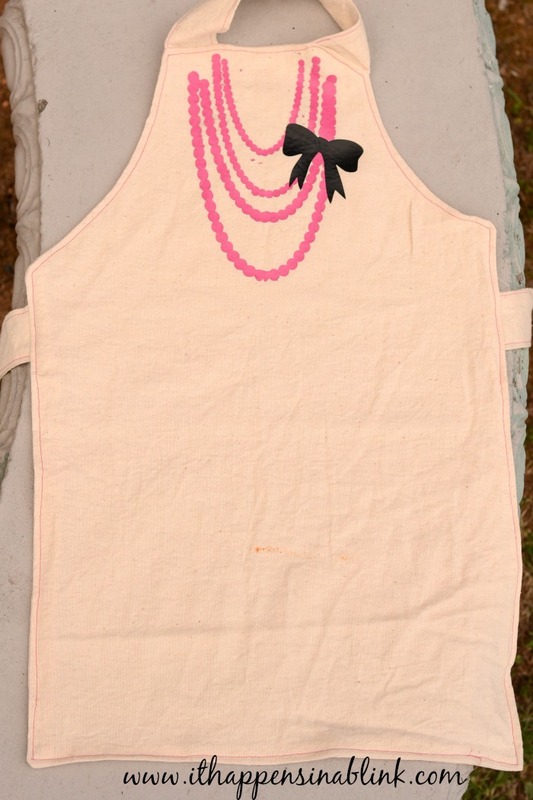 Since I have a girly girl, I created a Glam Girl apron, but feel free to embellish the apron for your child’s tastes. I will let you in on a little secret- I actually used drop cloth fabric for this apron. The kiddo is just going to get it messy, right? Begin by making the neck straps and waist straps. 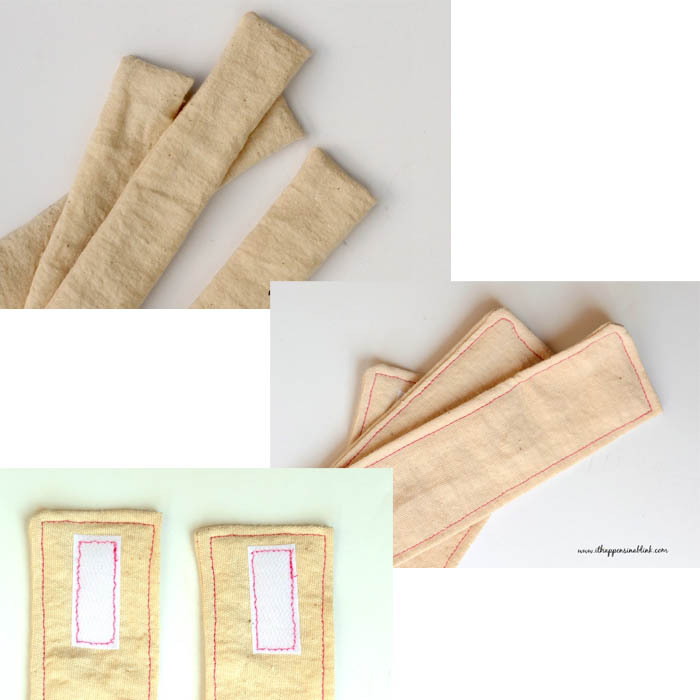 Cut two rectangles of fabric that are 10″ x 4″ (waist straps) and two rectangles that are 12″ x 4″ (neck straps). Fold them in half and pin them. Sew the rectangles around, leaving on end open. Clip the threads and the corners. Turn the rectangles right side out and iron flat. 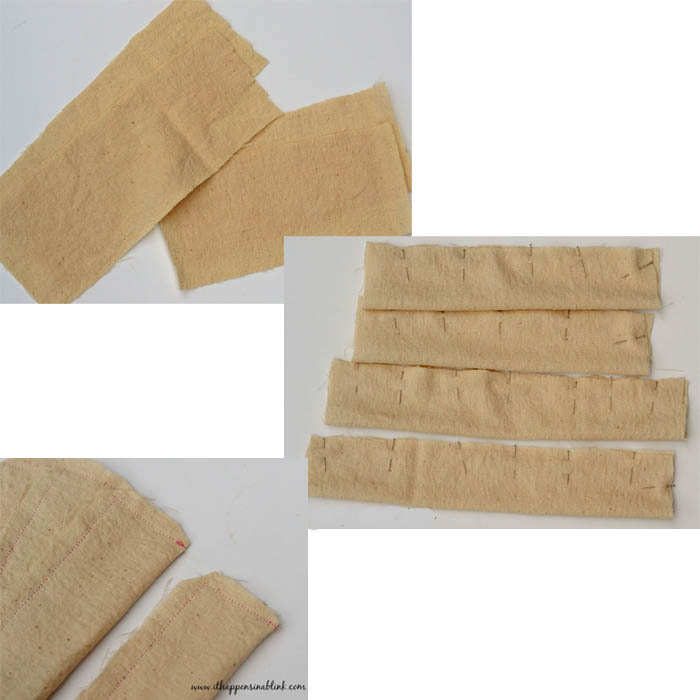 Cut pieces of velcro that are 1″ a piece. Pin a portion to each of the straps near the edge. One neck strap and one waist strap should have a soft piece, and one neck strap and one waist strap should have a rough piece. Sew the velcro on the straps, then set the straps aside. 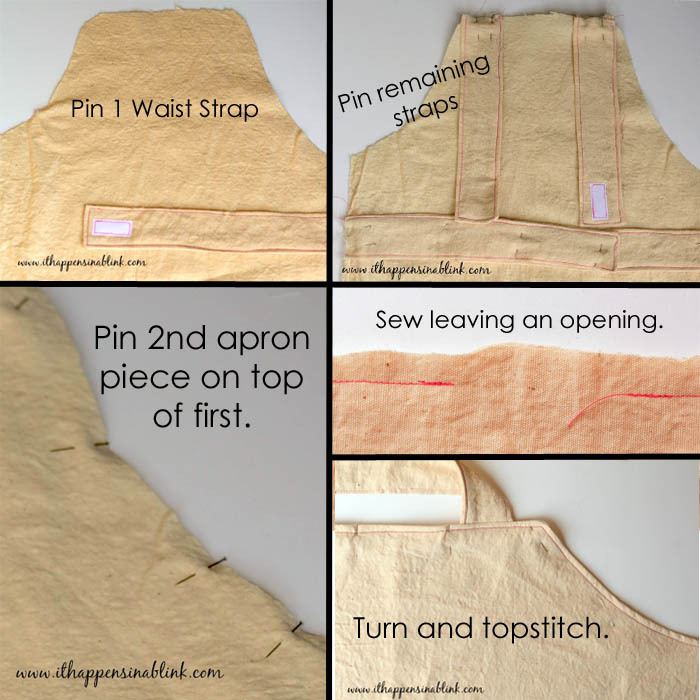 Print out the apron pattern and cut 2 pieces of the pattern. Lay one fabric piece down (right side up if there is a pattern to the fabric). Pin one of the waist strap pieces to the apron, about an inch from the corner as shown in the photo. Make sure the velcro piece is facing up. Continue pinning the velcro straps on the fabric as shown. Place extra pins in them so that they do not move while sewing. Cover this with the other apron piece– if the fabric has a pattern, place the pattern side down. Pin all the way around. Sew the apron leaving a 3 inch opening in the bottom for turning. Clip the strings and corners, then turn the apron. Press the apron with an iron and topstitch around the edge, making sure that the topstitch closes the bottom opening. The apron is now finished, minus the embellishment. For my apron, I downloaded the free Silhouette necklace and bow cut file from Crafty Jac. You will need access to a Silhouette cutting machine to use this file. Of course, you can use any iron-on or fabric paint to create an embellishment that is perfect for your little pizza chef! Ready for Pizza Night? I see another one in our future as soon as this week. Maybe I’ll even make one of these aprons for the hubby. He can rock a Glam Girl apron, too. That apron is so adorable. What a cute little pizza chef!! That apron came out great. I love it. 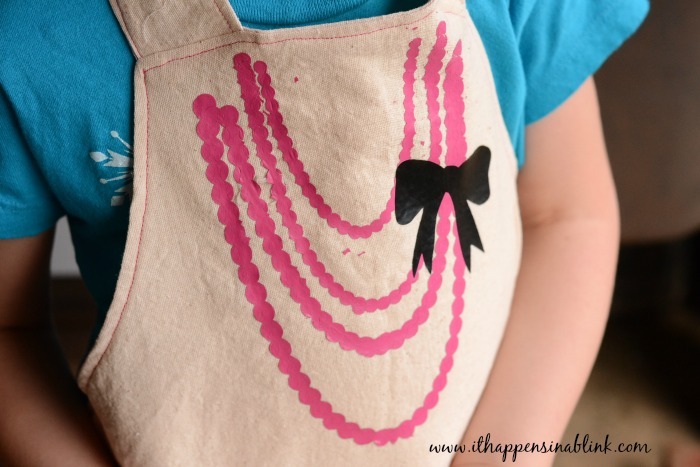 That apron is SO stinking cute…I want one like that! And LC would have a blast designing his own pizza. Yep, you can have it your way!! I love it! What a fun idea… love that pizza too! It’s a fave over at our house! Love the apron and what a great idea with the decorate pizza kits. The apron is adorable and you cannot go wrong with anything made by DiGiorno!! Cutest apron! She obviously loves this all around 🙂 And I have GOT to get my hands on one of these pizza kits- keep seeing how fun they are and we are missing out! What a fun and dual activity; great looking pizza and a cute kid; always a winning combo in my book! That apron is so cute! We love making pizza around our house. Thanks! That apron is absolutely adorable. My daughter would love it! I love that apron! 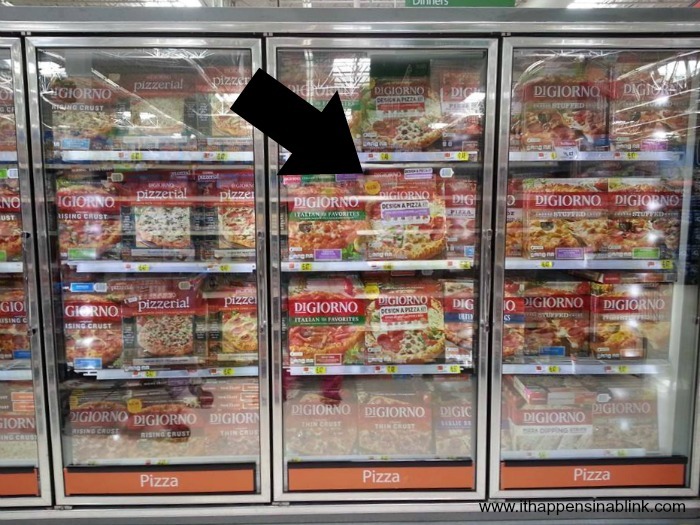 DeGiorno is my favorite frozen pizza–I have yet to see those kits but now I will look for them. I actually prefer meat and/or cheese–no veggies on my pizza-hopefully they have a kit like that! What a cute apron and I love pizza, I don’t think pizza has ever tasted bad. This is precious! Love the necklace & bow, so cute. Thanks for sharing. My sons LOVES that pizza! And the apron is adorable! The pizza looks good but that apron is stunning! What little girl would not want that. So adorable! What a fun idea for a playdate or kid’s party! How cool. I love DiGiorno pizza. And that apron is super cute. This is a great way to get kids involved! What a fun idea! My toddler would love it if I made him his own apron to help mama cook in! This is fantastic, Melanie! I love that you made this “from scratch”, and the pearls are just too precious. My girls would love this! From a drop cloth, no less! 🙂 Thanks, Tara! Soon she’ll have her own store! LOVE the apron! Looks like someone my daughter would love. I just cut out 2 coupons for this pizza and plan on purchasing it for my kids soon. These pizza’s are so cute and so is your daughter all dressed up in her apron!! Love it! 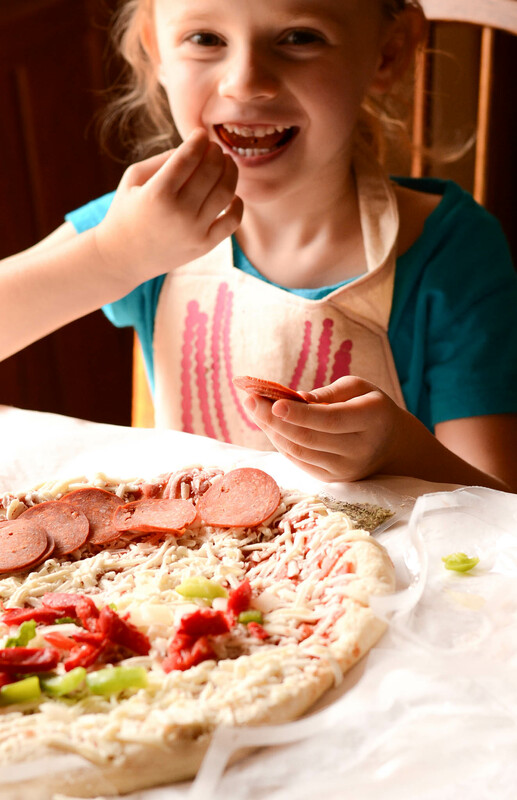 The pizza kits are such a fun activity to do with the kids. I love the apron pattern too. Thanks for sharing!! 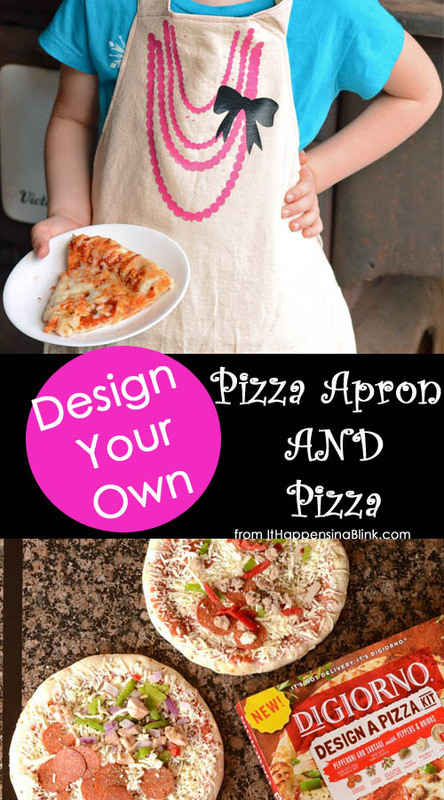 What a great idea to make the apron for the pizza! And for baking in general! It makes the eating such a special ocation! We always have DiGiorno in our freezer. It’s definitely the closest frozen pizza to the real thing! Love the apron!